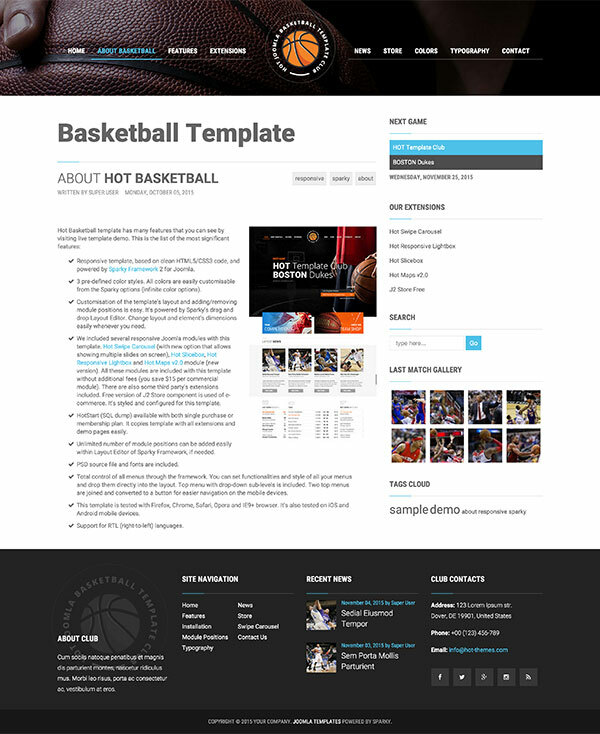 Basketball template is dedicated to one of the most popular games on the planet. 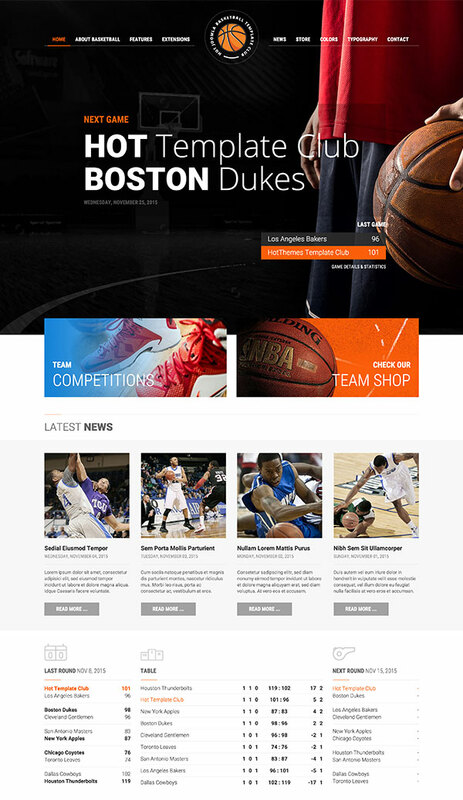 We created the Basketball template and dedicated it to the many small or big basketball teams in the world. All of them deserve a professionally designed and responsive online presence. 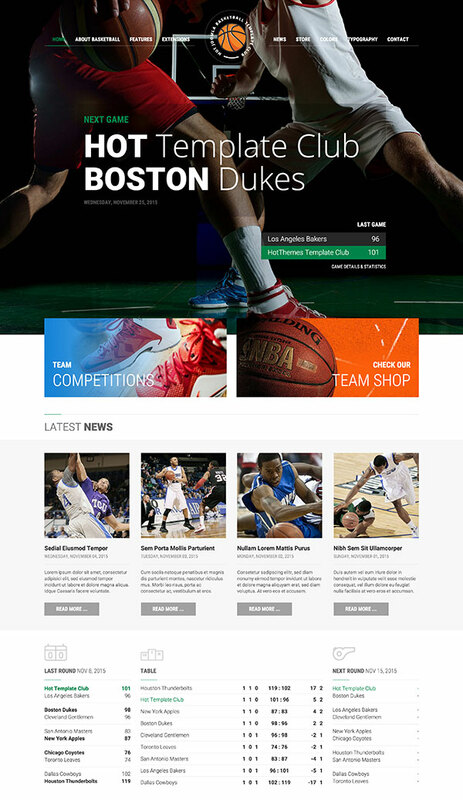 It will allow fans to be updated with latest news and results the team achieved. The website should also give the crucial information about team players. Basketball is a very popular sport in all continents and it's played on both professional and amateur levels. Probably the most famous league in the world is the NBA league. This association is gathering the best basketball players in the world. In Europe, millions of people are watching popular Euroleague which quality is not far behind the NBA league. Basketball is also popular as a sport for hobbyists. There are countless small basketball clubs formed from students or people who simply love playing basketball. Basketball can be played inside (in the sports halls) and even outside (in the schoolyards, parks, etc.). Probably all basketball clubs dream about more visitors and more tickets sold, especially the smaller clubs. 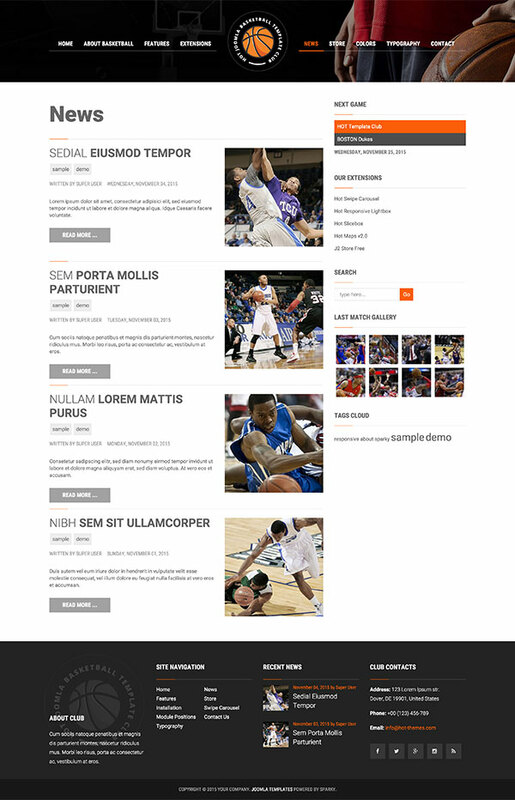 Therefore, in Basketball template, we gave focus to the next game throughout the site. On all pages, visitor can see when is the next game and who's the opponent. It will probably lead the site visitors to buy the ticket and visit the next game live. 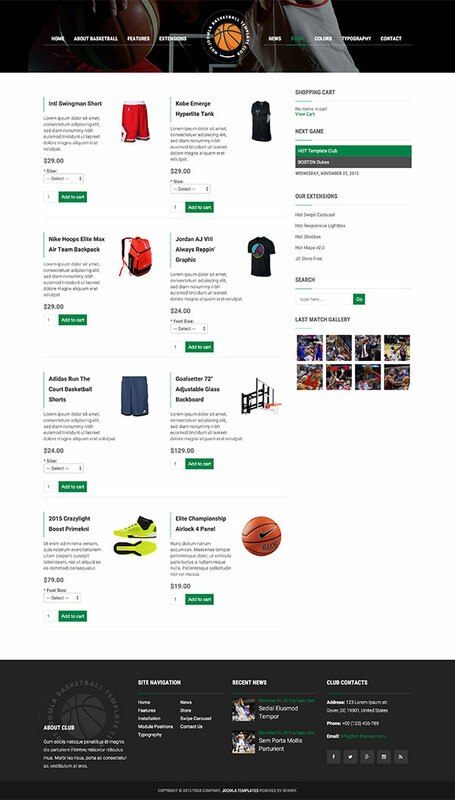 Finally, the Basketball template contains a small online store that basketball team could use for selling stuff with club imprints to the fans and gain extra income. 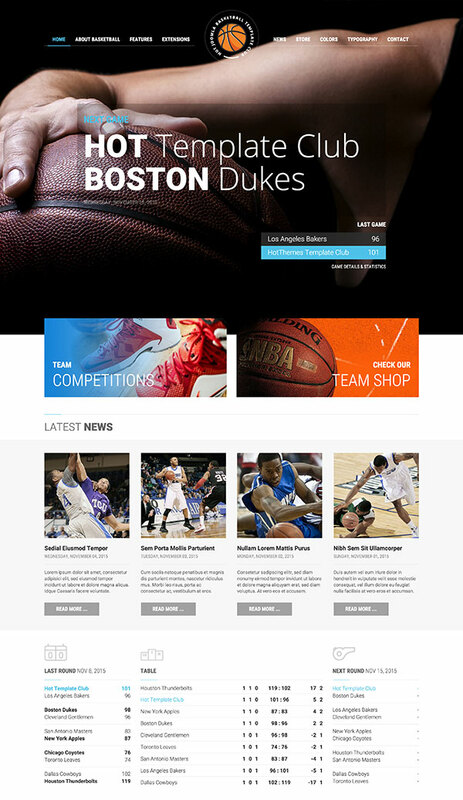 We included several responsive Joomla modules with this template. Hot Swipe Carousel (with new option that allows showing multiple slides on screen), Hot Slicebox, Hot Responsive Lightbox and Hot Maps v2.0 module (new version). All these modules are included with this template without additional fees (you save $15 per commercial module). There are also some third party's extensions included. 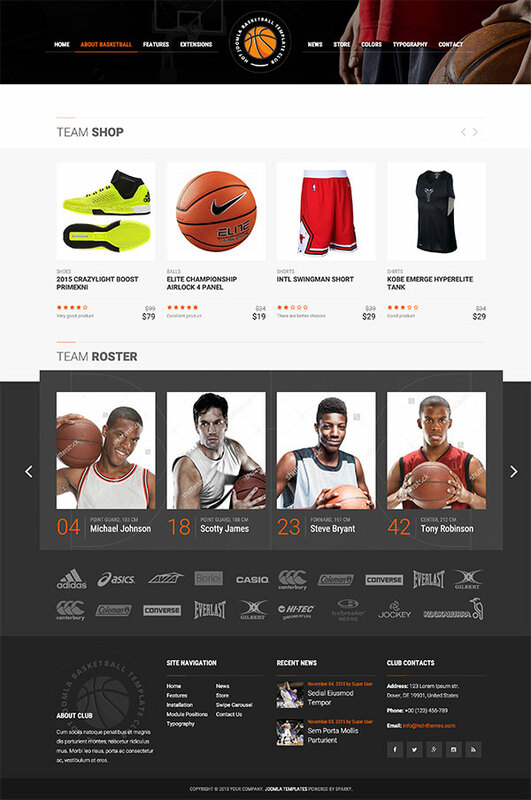 Free version of J2 Store component is used of e-commerce. It's styled and configured for this template.